Mark C. Molumphy, a Principal at Cotchett, Pitre & McCarthy, is a native of the Bay Area, born in San Mateo, California. Molumphy joined Cotchett, Pitre & McCarthy in 1993, practicing civil litigation with an emphasis on complex business disputes, securities, antitrust, insurance bad faith, and products liability. Molumphy was presented the Community Service Award by the Jack Berman Advocacy Center of the American Jewish Congress for his work on the landmark 101 California Shooting Litigation. Molumphy was also a finalist for the Consumer Attorneys of California Attorney of the Year award in 2014, based on his work as lead counsel for a nationwide class of investors in Medical Capital, which operated a massive Ponzi Scheme. Molumphy helped to secure over $173 million in settlements, the largest Ponzi Scheme recovery in California history. In 2015, Molumphy was selected as one of the Top 100 lawyers in Northern California by Super Lawyers. Molumphy has extensive experience in consumer and investor fraud class actions, including Smith v. Merrill Lynch (Orange County Bond Litigation), Estate of Jim Garrison v. Warner Bros. Inc., Campbell v. Acclaim Entertainment, Inc., In re Pilgrim Securities Litigation, Informix, and Central Bank. He also served as lead counsel in several groundbreaking derivative actions, including Oracle, where he successfully urged the federal court to invalidate a forum selection clause inserted into corporate bylaws without shareholder approval, an issue of first impression. He currently serves as counsel in shareholder derivative actions brought on behalf of PG&E, arising from the San Bruno gas line explosion, HP, relating to its acquisition of Autonomy, Apple, relating to anti-poaching agreements, and Federal Express, following its criminal indictment for illegally distributing prescription drugs. His work has resulted in the recovery of millions of dollars and the implementation of novel governance reforms for the companies and their shareholders. Molumphy also negotiated multi-million dollar settlements on behalf of former shareholders of Bay Meadows Race Track and mutual fund shareholders of Janus. Molumphy served as lead counsel in the Freddie Mac preferred shareholder securities litigation, following the government’s historic takeover in 2008, and represented numerous cities and counties in California related to their investment losses in Lehman Brothers, Washington Mutual and AIG, amongst others. Molumphy currently serves as counsel for investors of BP, relating to losses suffered from the Gulf of Mexico disaster. Molumphy is active in community affairs. He served on the Board of Directors and currently serves as a volunteer for the Legal Aid Society of San Mateo County, which provides free legal services to low-income children, families and seniors. He also has been appointed counsel by the Federal Court as part of the court's pro bono program. 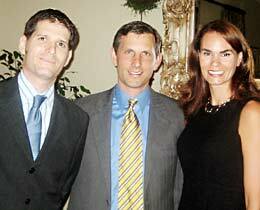 In September 2007, Molumphy and Cotchett, Pitre & McCarthy were honored with the "Angel Award" by the Parca Auxillary, a private nonprofit organization that serves people with developmental disabilities and their families in the Bay Area. See Parca Auxiliary Press Release PDF. Molumphy is a frequent speaker on complex litigation and co-authored "Punitive Damages: How Much Is Enough?" Civil Litigation Reporter, CEB, 1998. He also has appeared as a panelist on programs, including "Strategic Tips For Successfully Propounding and Opposing Written Discover," "Punitive Damages: Maximizing your Client's Success or Minimizing Your Client's Exposure," "Developments in Class Action Litigation," and "FDA 2009 - Key Issues Facing Life Sciences Companies." Punitive Damages: How Much Is Enough? Investors Action Against Oportun Financial Corp.